After writing my review for The Labyrinth in June, I was generously sent review copies of Megasaurus and The Cave Monster, two more books in The Lima Bear series. I couldn’t wait to read these books to my children who have enjoyed this series so much. First we read Megasaurus, the first book in the Lima Bear series, it’s a story about the kingdom of Beandom, which is under attack by a monster! What is the king of Beandom to do? Who will save Beandom? Will it be Howl the Owl, who thinks the solution is pancakes? Towel the Owl, who thinks bows and arrows will drive the monster away? Vowel the Owl, who thinks a wall made of strong rocks will keep the monster out? Or will it be L. Joe Bean who has an idea that’s just a bit “outside the box”? This story was so gripping! It’s the type of story that you can’t just walk away from half way through. You just want to stick around to see which idea will work. I just love how many life lessons come out of each story in the Lima Bean series. Megasaurus to me is a story about a bully who gets outwitted by the “little guy”, and given a taste of his own medicine. There are great displays of courage by the three wise owls but especially by L. Joe Bean. I don’t want to give too much of the story away because frankly you just have to read it for yourself! 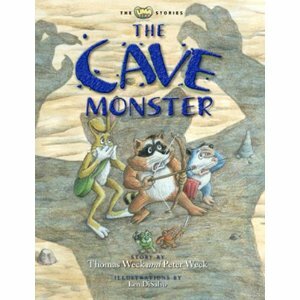 The Cave Monster, the third book in the Lima Bear series, is a story about friends on a rescue mission to save L. Joe Bean. They overcome their fears and take on the cave monster in an epic battle. The courage and bravery shown by all the characters, I think, is the take away lesson of this story. You’ll find yourself cheering on the characters as they fight the cave monster. As I’ve mentioned in previous posts(How Back-Back Got His Name and The Labyrinth), all the books have a section in the back for extended learning opportunities, which I absolutely love! The activities really help to drive home the lessons from the books. 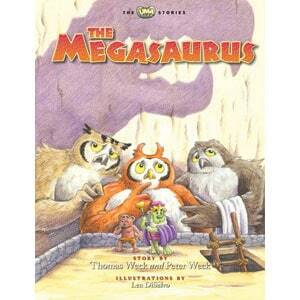 Megasaurus and The Cave Monster are recommended for ages 4-8 and both books retail for $15.95. Thomas Weck is a creative and captivating national award-winning author of children’s books. He has traveled extensively in the U.S. and in foreign countries including teaching children through the Peace Corps. With four children of his own and a passion for observing children’s behavior, he has distilled these observations into stories that excite the imagination of young minds amidst peals of laughter and learning. Peter Weck grew up enjoying the wonderful stories his father told about Lima Bear and his friends. Now that he is the father of three young girls, he has teamed up with his father to capture these and other stories in print. Peter’s goal is to help children foster a love for creating, reading, and listening to stories. He currently serves on the board of the Menlo Park Library Foundation and is CEO of StoryJumper, a web based company that enables anyone to create and illustrate children’s stories. Len DiSalvo is an illustrator and animator for a wide range of print projects and award-winning computer games. He currently teaches art illustration and animation at the Art Center Design College in Tucson, Arizona.